An 82 year old healthy and high functioning gentleman had been feeling unwell for several days with progressive dyspnea. He walked into the emergency department with his son, sat down in a chair in ambulatory triage and promptly became unresponsive. He was wheeled into the resus bay where he was apneic and pulseless with a PEA rhythm. Cardiac arrest care included chest compressions, laryngeal mask ventilation, epinephrine, calcium, and bicarbonate, without ROSC. Ultrasound initially showed no cardiac activity which progressed to minimal cardiac activity without palpable pulses, ECG demonstrated ST elevations in V1 and V2. 50 mg alteplase was given without improvement of echo or ROSC; a second 50 mg dose was given 15 minutes later which also had no discernible effect. Throughout the period of cardiac arrest care, including during periods of cardiac standstill, the patient became awake during chest compressions and opened his eyes, tracked staff, made purposeful movements toward the laryngeal tube and toward the person doing chest compressions as well as flailing, distressed lower extremity movements. 100 mg ketamine was given to good effect, repeated once. After 75 minutes, the decision was made with the patient’s son that further resuscitative efforts were unlikely to be successful. Chest compressions were halted, and the patient was pronounced deceased. Clinicians who care for cardiac arrest patients should be aware of–and have a plan for–CPRIC. Members of the resuscitation team may be alarmed by a patient who is conscious during chest compressions and should be reassured that this is a well-described phenomenon demonstrating the potential of high quality chest compressions and high quality cardiac arrest care to perfuse vital organs. As captured in the video, our patient was conscious during pulse checks (i.e. while chest compressions were paused), illustrating how perfusion pressures fall gradually following the cessation of cardiac output. It seems inhumane to leave a patient awake while an artificial airway is in place and while the patient is receiving chest compressions, not to mention tube thoracostomy, pericardiocentesis, etc. Pound et al describe a patient so active during CPR that he was able to significantly interfere with resuscitative efforts. Most CPRIC authors recommend intra-arrest sedation with midazolam or ketamine; one group proposes a CPRIC sedation protocol. After the decision was made with family to terminate resuscitation, our patient was allowed to emerge from ketamine dissociation to say goodbye to his loved ones while at least partially conscious. This emotionally charged circumstance has not been previously described but may merit further consideration as cardiac arrest care improves and CPR-induced consciousness becomes more common. Thank you to the patient’s relatives and the clinicians who consented to the distribution of video footage for educational purposes. 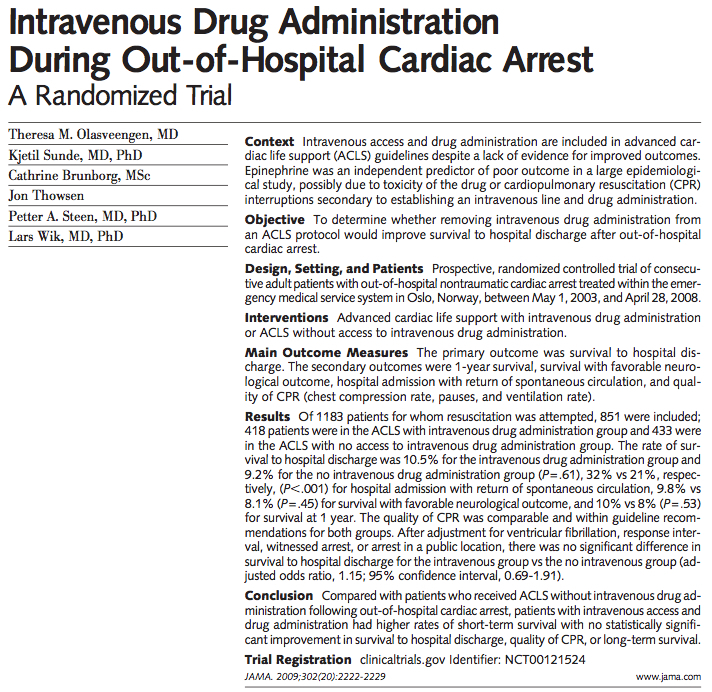 It has been repeatedly demonstrated that the use of drugs empirically does not work in cardiac arrest. Despite this, ACLS often feels like an algorithmic march down a menu of pharmaceuticals, one drug after the next, hold compressions, ok still asystole, have we tried bicarb? Until everyone has had enough and the patient is pronounced. There are three things you can do to benefit your patient in cardiac arrest. The first is good chest compressions, which serves mostly to buy time. The second is shocking shockable rhythms, and the third is identifying and treating the cause of cardiac arrest. The use of a vasopressor in the right dose probably offers some benefit; unfortunately we can’t figure out what the right dose is and epinephrine 1 mg every few minutes is almost certainly way too much. Which drug is next keeps you busy and is the focus of how ACLS is taught, which is why it’s so dangerous: it feels right but not only does not benefit the patient, which drug is next distracts you from the most important task in cardiac arrest, which is figuring out why the patient in front of you just died, so you can offer a treatment to address it. Dysrhythmia is a central cause of cardiac arrest; as soon as a cardiac monitor is available, check a rhythm and if shockable, shock immediately. If you’re not sure if the rhythm is shockable, shock. The harm caused by an unindicated shock is trivial compared to the harm of untreated pulseless vtach or vfib. Acute coronary syndrome is a hugely important cause of cardiac arrest, but causes cardiac arrest predominantly by dysrhythmia, which you will fix by checking the rhythm early and often. ACS can also cause cardiac arrest by pump failure, these patients may benefit from emergent reperfusion and would ideally be in a cath lab, if we knew that acute coronary artery occlusion was the problem. If you think ACS is the cause of arrest, cath lab is not an option, and the patient seems salvageable, give a thrombolytic. The data is equivocal in this context but I think the majority of resuscitationists would offer it for hearts too good to die. Any sufficiently severe insult to airway or breathing can cause cardiac arrest, fortunately they are all treated at once with 100% FiO2 through an endotracheal tube. If the cause of cardiac arrest is unlikely to be primarily A or B, intubation can be deferred in favor of a supraglottic device; however, if A or B is the problem, all efforts should be directed at establishing oxygenation, usually via endotracheal intubation. Diverting your finite cognitive powers to ACLS drugs in respiratory arrest is particularly poor care. 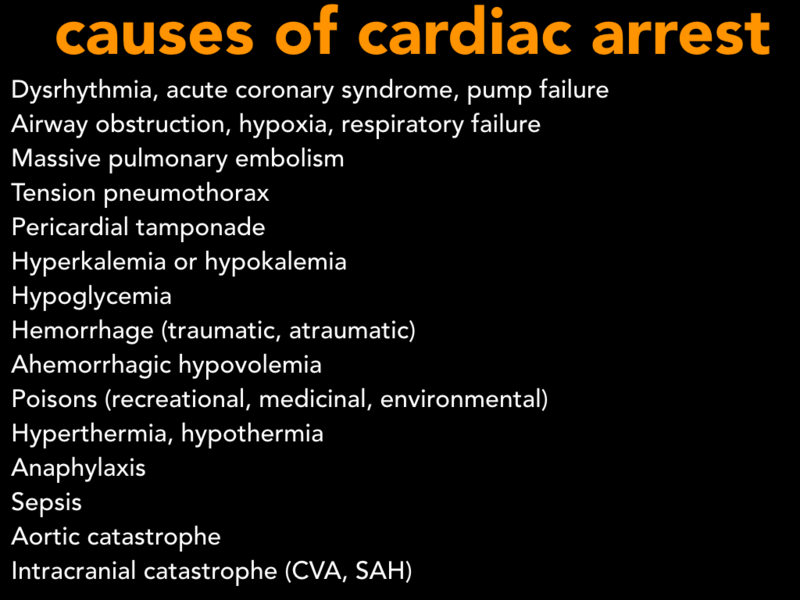 There are three common, crucially important obstructive causes of cardiac arrest. Pericardial tamponade and tension pneumothorax are easily excluded and should be explicitly excluded in every case of undifferentiated arrest. Massive pulmonary embolism is amenable to reperfusion therapy, usually with intravenous thrombolysis–consider risk factors, exam signs, and ultrasound the legs and RV when the context fits. Hyperkalemia is common, immediately lethal, and readily treatable. Calcium should be given to most arrested patients with kidney disease, and hyperK is a great reason to push for point of care electrolytes testing in your shop. Hypokalemia is much less common but also easily treated and a particular consideration in malnourished patients. Likewise hypoglycemia–fingerstick testing is routine if POC blood gas not available, and empiric use of D50 is reasonable in diabetics or liver patients. Hemorrhage is of course most relevant in trauma, which may be occult, but the peritoneum is easily sonographed and uncrossmatched blood remains one of our best therapies. 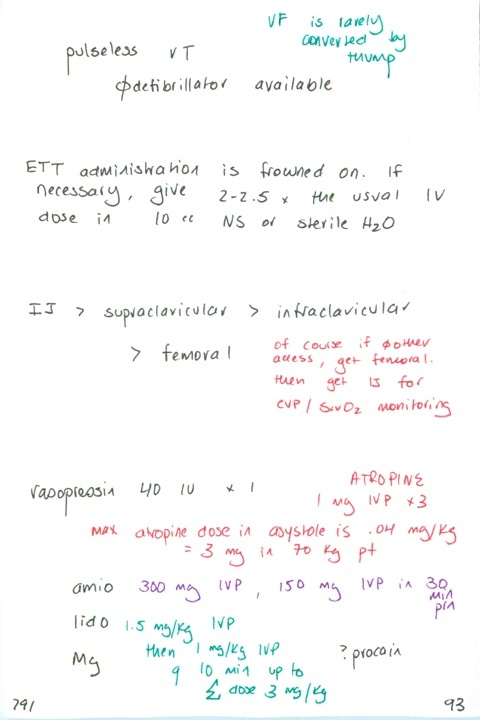 Ahemorrhagic hypovolemia is even more treatable though an uncommon cause of arrest in developed countries. There are several key antidotes to important toxins, intralipid is a rising arrest therapy to consider if a cardiotropic medication is suspected; bicarb, digibind, and hydroxocobalamin may also restore circulation in the poisoned patient. Hyperthermia is hopefully easily identified; treatment can be tricky but should involve some form of icewater in most cases. 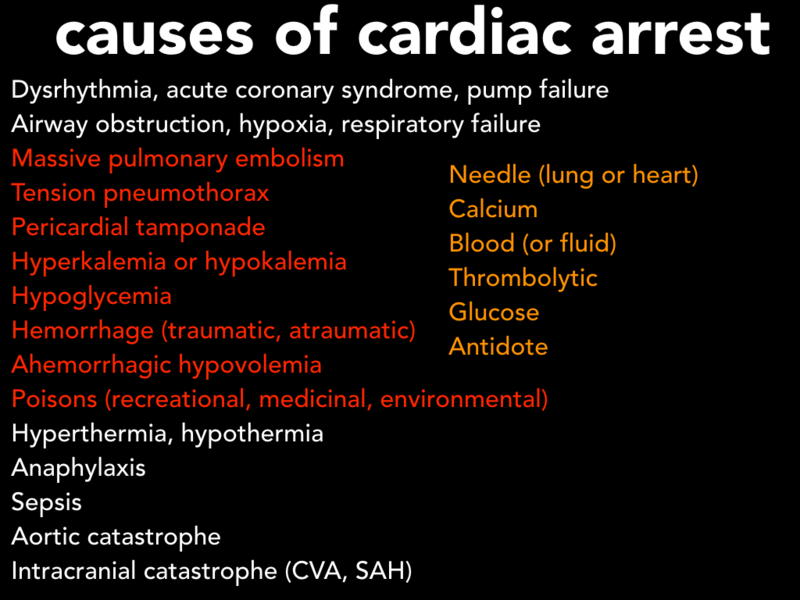 Hypothermia is an important cause and effect of cardiac arrest and determining which can sometimes be a challenge. Anaphylaxis as a cause of cardiac arrest will be treated by airway management and the epinephrine you’re giving anyway. Once the patient has arrested from sepsis or an aortic or intracranial catastrophe, it is unlikely that you will be able to meaningfully reverse the process. Though excellent, step-by-step algorithms exist, it can be difficult to remember this differential while managing an arrested patient as well as your team of providers which, when large enough, invariably obstructs rather than augments care. However, once you’re used to taking care of pulseless patients, the differential can be streamlined. You’re not going to forget to look for and shock shockable rhythms or intubate. Hyperthermia and hypothermia announce themselves, anaphylaxis will be treated with your supportive therapies and the last three causes are more or less irreversible once the patient is dead. This just leaves eight causes which are treated with six therapies. Six is the perfect number of items for a mnemonic. 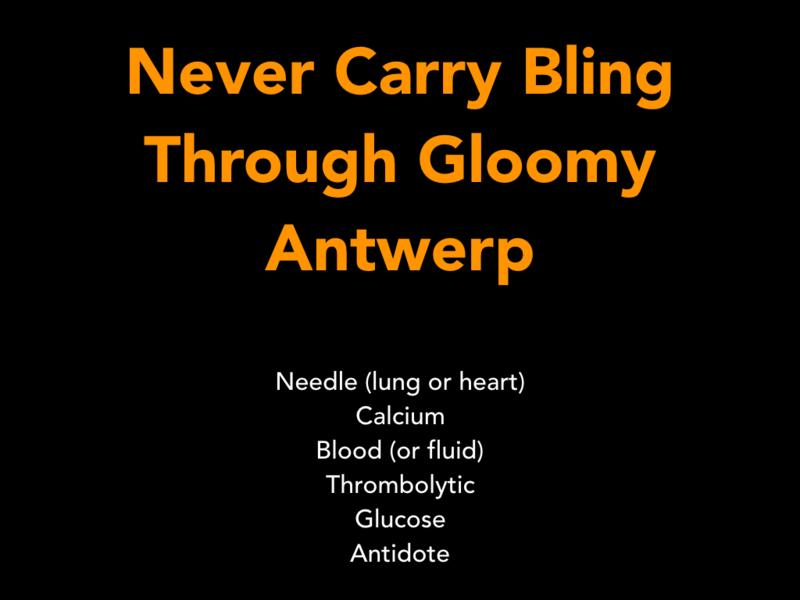 If you’ve ever been to Antwerp you know it is gloomy as hell, and you would never, ever carry bling through gloomy Antwerp. Needle, calcium, blood/fluid, thrombolytic, glucose and antidote are the six things to remind yourself to consider in the arrested patient. It’s the Hs and Ts, evolved for our post-ACLS age. Lastly, if you are able to put arrested patients on bypass/ECMO, you are playing a different game than the rest of us and that game has a different set of rules. Come up with your own mnemonic that includes Antwerp. 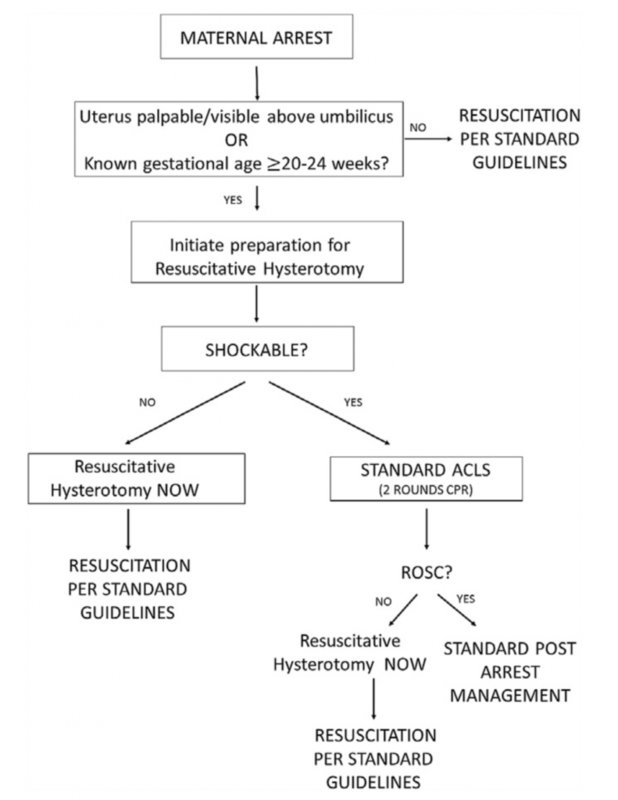 To appear in the March 2011 issue of EM Practice Guidelines Update. Thanks to sigrid hahn, scott weingart, kaushal shah, kit tainter, rob arntfield. Eight slides culled from my ACLS Therapeutics lecture. 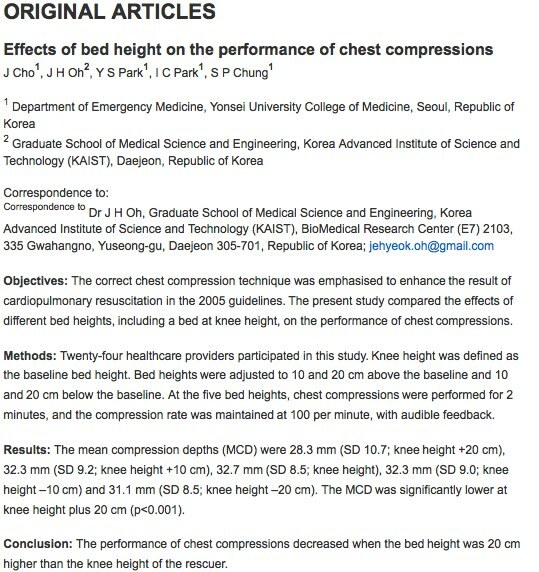 Compressions should be done with bed at the level of the knees of the person doing chest compressions. Emerg Med J. 2009 Nov;26(11):807-10. 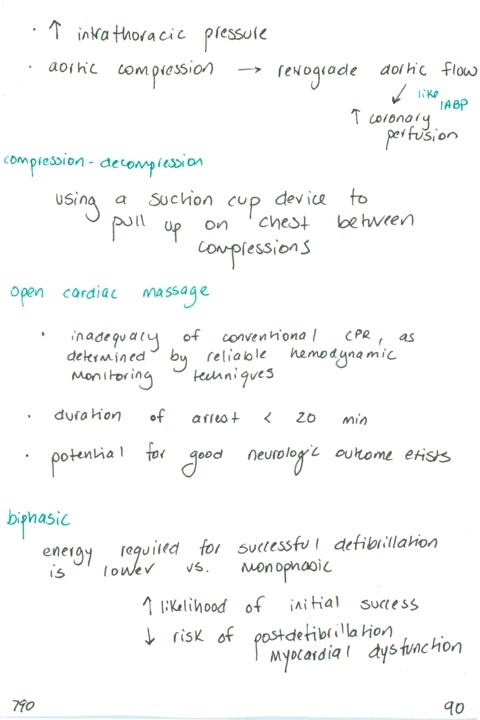 The resuscitation of a patient who is in cardiac arrest of unknown etiology in PEA or asystole proceeds with the simultaneous management of the ABCs and addressing the likely elements in the differential. Think Hs and Ts. Although the administration epinephrine (and, formerly, atropine) is emphasized in codes, these agents do not benefit arrested patients. Your only chance to reanimate a patient in PEA or asystole is to reverse the underlying cause. Take your own pulse, take a step back, and think Hs and Ts.